Complementary and alternative therapies are being practiced in several areas of medicine. Find out how they are being integrated into behavioral health. During the past century, the American healthcare system has made tremendous technological and pharmacological advances in the treatment of disease. Yet, an increasing number of people have started looking for nontraditional, less mainstream methods of fighting illnesses. These methods, often lumped together under the title of complementary and alternative medicine (CAM), have attracted much attention from consumers, healthcare providers, and the media. More than 38% of adults and nearly 12% of children nationwide use some form of CAM, according to the National Center for Complementary and Alternative Medicine. While CAM has mostly been associated with the treatment of physical problems, it is becoming more common in the behavioral health field. Practices such as acupuncture, herbal medicine, meditation, and massage have been touted as remedies for everything from addiction and depression to anxiety and insomnia. Many behavioral health professionals, including social workers, have eagerly incorporated CAM into their work, while others have approached it cautiously or rejected it outright. But, no matter their opinion, knowledge of CAM’s potential benefits and pitfalls is becoming essential for social workers who want to empower clients to make wise choices regarding its use. The National Center for Complementary and Alternative Medicine, which is part of the National Institutes of Health, defines CAM as “a group of diverse medical and healthcare systems, practices, and products that are not generally considered to be part of conventional medicine.” The center puts CAM therapies and practices into five groups: whole medical systems, mind-body medicine, biologically based practices, manipulative and body-based practices, and energy medicine. A primary reason why CAM continues to gain popularity, observers say, is because it appeals to people who are dissatisfied with the traditional healthcare system, which is considered too impersonal, inaccessible, bureaucratic, and disease oriented. These people often believe that CAM provides a less invasive, more emotionally comforting approach to care. CAM also provides alternative options for people with medical conditions that cannot be cured or easily controlled with conventional medicine. And many people who fear the side effects of prescription medications seek CAM because they perceive it to be more natural and safe. In addition, immigration trends and the resulting cultural influences also may be contributing to the growth of CAM nationwide. An increasing number of immigrants and refugees to the United States are coming from non-European countries where practices such as folk medicine, acupuncture, and the use of herbal remedies are more common and enjoy wider acceptance. For example, a study of more than 1,000 Mexican Americans living in Texas found that approximately 45% of them had used CAM within the past 12 months (Martinez, 2009). Fang and Schinke (2007) found that 82% of 153 Chinese American patients accessing mental health services at community health centers in New York City reported current use of complementary therapies. Leslie Davenport, MFT, has seen similar results with the clients who go to the Institute for Health & Healing in San Francisco seeking help for anxiety, depression, posttraumatic stress disorder, and other mental health issues. The institute’s services, which include acupuncture, massage, nutritional guidance, and instruction in guided imagery, provide an alternative for clients who have been frustrated by their lack of success with more traditional approaches, Davenport says. CAM’s popularity is not limited to private practice settings. Several academic institutions have established centers devoted to studying and promoting an integrative approach to physical and behavioral healthcare. Such settings give clients a way to access CAM services in an environment where they can responsibly try alternatives, says David Spiegel, MD, medical director of the California-based Stanford Center for Integrative Medicine, which is part of Stanford University. In addition to psychotherapy, the center’s offerings include hypnosis, acupuncture, biofeedback, and massage. If CAM is becoming more popular for treating behavioral health problems, does that mean that research shows that it works? Well, maybe. A plethora of studies has been conducted to test the effectiveness of CAM techniques for various addictions and mental health conditions. The results have been mixed, with some CAM practices showing more promise than others. One study (Stuyt & Meeker, 2006) found that individuals who used acupuncture as part of a dual-diagnosis treatment program reported significant improvement in concentration, sleep, energy, and pain management compared with individuals who did not receive acupuncture. And a meta-analysis by Liu, Shi, Epstein, Bao, and Lu (2009) of randomized trials analyzing the use of acupuncture to relieve opiate withdrawal symptoms concluded that acupuncture seemed to reduce the rate of withdrawal symptoms and the need for medications such as methadone. However, a research trial conducted by Bearn, Swami, Stewart, Atnas, Giotto, and Gossop (2009) reported that acupuncture had no effect on withdrawal severity or craving on a group of patients with opiate dependence. There appear to be fewer success stories regarding the use of CAM to treat alcohol and nicotine dependence. In an examination of clinical trials, Lu, Liu, Zhu, Shi, Liu, Ling et al. (2009) demonstrated that acupuncture showed poor efficacy for alcohol and nicotine withdrawal and relapse prevention. And people using acupressure beads in a stop-smoking clinic in the United Kingdom did not think the beads were significantly more effective than nicotine replacement therapy or group behavior therapy (Horowitz, 2009). However, several CAM practices have been shown to help alleviate depression. St. John’s wort repeatedly has been found to relieve mild to moderate depression, and a dietary supplement called SAMe may also be effective (Andreescu, Mulsant, & Emanuel, 2008). In addition, several studies have supported the use of mindfulness as a treatment for depression (Bertisch, Wee, Phillips, & McCarthy, 2009). Kava extract has reduced some cases of anxiety (Woolhouse, 2007), as has acupuncture (Horowitz, 2009). Other studies have shown that Chinese herbal medicine and acupuncture reduce the severity of the often-serious side effects associated with antipsychotic medications (Horowitz, 2009; Woolhouse, 2007). The mixed research results should be a reminder to behavioral health professionals that they have a duty to critically analyze CAM techniques before incorporating them into their practice, Gordon says. Being excited by a particular technique does not justify ignoring research about its effectiveness, he says. Anna Stookey, MFT, CHt, uses meditation, visualization, and guided imagery in her counseling practice in Beverly Hills, CA. She resists accepting other CAM practices because she says that they are outside of her scope of expertise while fearing many other practitioners don’t take that same cautious approach. William Shryer, DCSW, LCSW, clinical director of Diablo Behavioral Healthcare in Danville, CA, often sees the results of what happens when clients put too much faith in CAM techniques. Many people come to Diablo after trying CAM techniques that have failed, especially debatable remedies being promoted to parents of children with autism. Losing money is not the only risk clients face when using CAM practices. Many CAM practices are not as safe as clients perceive them to be. This is especially true with herbal remedies and megadoses of vitamins, some of which can have serious side effects and can cause dangerous interactions with prescription medications and each other. Adding to the confusion is that many CAM therapies are subject to far less regulatory scrutiny than are interventions used in conventional medicine. No matter their personal beliefs about CAM, social workers and other behavioral health professionals must face the reality that CAM’s popularity likely will continue to grow. However, how that popularity manifests itself in the future may be affected by the state of the economy, observers say. It’s hard to determine how the recession is affecting demand for CAM services, Spiegel says. People who find themselves underinsured or uninsured may turn to CAM to avoid high-cost visits to doctors or hospitals. But, at the same time, other people may cut down on CAM services that are not covered by insurance. The new sense of thriftiness resulting from the recession is forcing many clients to take a hard look at which CAM techniques have the most value and the most data to back them up, Stookey says. Consumers can no longer afford to blindly follow fads when it comes to CAM, she says. Not only are more Americans delving into the world of complementary and alternative medicine (CAM), but they are willing to spend significant amounts of their own money to access CAM services. U.S. adults spent an estimated $33.9 billion out of pocket in 2007 on visits to CAM practitioners and on CAM products, classes, and materials, according to a July report released by Health and Human Services. That’s up from an estimated $27 billion in spending in 1997. • Out-of-pocket spending on CAM accounted for 1.5% of total healthcare expenditures in the United States and 11.2% of total out-of-pocket healthcare expenditures. • Nearly two thirds of out-of-pocket spending on CAM was for self-care purchases of products, classes, and materials, with the remainder spent on visits to CAM practitioners. The largest portion of self-care spending was on herbal supplements, followed by spending on yoga, tai chi, and qigong classes; homeopathic medicine; and information about relaxation techniques. • About three quarters of both visits to CAM practitioners and out-of-pocket spending on CAM practitioners were associated with manipulative and body-based therapies such as chiropractic manipulation and massage. On average, U.S. adults spent nearly $122 per person for visits to CAM practitioners. Data for the report came from the results of more than 23,000 interviews conducted as part of the 2007 National Health Interview Survey. The full report, “Costs of Complementary and Alternative Medicine (CAM) and Frequency of Visits to CAM Practitioners: United States, 2007,” is available on the Web site of the National Center for Complementary and Alternative Medicine (http://nccam.nih.gov). Andreescu, C., Mulsant, B. H., & Emanuel, J. E. (2008). Complementary and alternative medicine in the treatment of bipolar disorder—a review of the evidence. Journal of Affective Disorders, 110(1-2), 16-26. Bearn, J., Swami, A., Stewart, D., Atnas, C., Giotto, L., & Gossop, M. (2009). Auricular acupuncture as an adjunct to opiate detoxification treatment: Effects on withdrawal symptoms. Journal of Substance Abuse Treatment, 36(3), 345-349. Bertisch, S. M., Wee, C. C., Phillips, R. S., & McCarthy, E. P. (2009). Alternative mind-body therapies used by adults with medical conditions. Journal of Psychosomatic Research, 66(6), 511-519. Fang, L., & Schinke, S. P. (2007). Complementary alternative medicine use among Chinese Americans: Findings from a community mental health service population. Psychiatric Services, 58(3), 402-404. Horowitz, S. (2009). Acupuncture for treating mental health disorders. Alternative and Complementary Therapies, 15(3), 135-141. Liu, T. T., Shi, J., Epstein, D. H., Bao, Y. P., & Lu, L. (2009). A meta-analysis of acupuncture combined with opioid receptor agonists for treatment of opiate-withdrawal symptoms. Cellular and Molecular Neurobiology, 29(4), 449-454. Lu, L., Liu, Y., Zhu, W., Shi, J., Liu, Y., Ling, W., et al. (2009). Traditional medicine in the treatment of drug addiction. American Journal of Drug and Alcohol Abuse, 35, 1-11. Martinez, L. N. (2009). South Texas Mexican American use of traditional folk and mainstream alternative therapies. Hispanic Journal of Behavioral Sciences, 31(1), 128-143. Stuyt, E. B., & Meeker, J. L. (2006). Benefits of auricular acupuncture in tobacco-free inpatient dual-diagnosis treatment. Journal of Dual Diagnosis, 2(4), 41-52. Woolhouse, M. (2007). 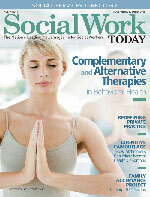 Complementary therapies in mental health care. Australian Family Physician, 36(4), 247.